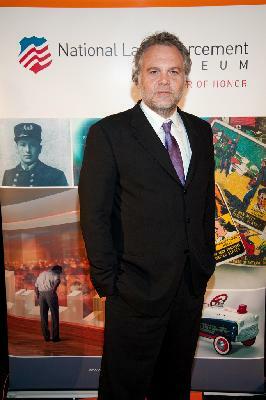 On Friday, April 19, Actor Vincent D’Onofrio traveled from New York City to Pleasant Grove, Utah to support the National Law Enforcement Officers Memorial Fund. Vince joined John Shanks from the Memorial Fund and did several radio and television interviews promoting the Memorial Fund’s mission and work. That evening, Vince joined over 650 law enforcement supporters, who filled the auditorium at Pleasant Grove High School for a screening of Heroes Behind the Badge, a documentary film—narrated by Vince—that tells the stories behind the badge of the men and women who serve our communities every day. During the pre-screening reception, Vince met with the family of U.S. Border Patrol Agent Nicholas J. Ivie (End of Watch: 10/2/12). Agent Ivie was shot and killed in Arizona after responding to an activated sensor along the border. Vince talked extensively with Agent Ivie’s wife, parents, and brother, about their lost loved one. Vincent D’Onofrio is a lot of things to a lot of people. To the National Law Enforcement Officers Memorial Fund he is more than an actor who portrayed Detective Bobby Goran on Law & Order: Criminal Intent. Vince is a kind and genuine individual who honors the service and sacrifice of our law enforcement professionals and respects their families. His support doesn’t end there! Vince is currently our top fundraising participant for the Ride and Run to Remember. On behalf of everyone at the Memorial Fund, please join us in thanking Vincent D’Onofrio for his service and dedication as a volunteer leader with the National Law Enforcement Officers Memorial Fund. This morning an Unveiling Ceremony was held at the National Law Enforcement Officers Memorial, to present the newly-engraved names of two officers who made the ultimate sacrifice in 2012: National Park Ranger Margaret Anderson and Prince William County (VA) Police Officer Chris Yung. Family, friends, and colleagues of both fallen officers joined Memorial Fund staff for the special ceremony. 2013 Unveiling Ceremony, a set on Flickr. National Park Service Director Jon Jarvis shared some words about Park Ranger Margaret Anderson. “She will always be a part of us, and today she's a part of the National Law Enforcement Officers Memorial,” he said. Prince William County (VA) Police Chief Steve Hudson spoke about Officer Chris Yung. “Chris had an infectious smile that impacted everyone he met,” he said. Chief Hudson also told the group of Chris’s daily philosophy of “striving to be sure he did things better tomorrow than he had done today.” “It is incumbent upon all of us to continue to learn from that example,” he said. These names are two of the 321 being added to the Memorial this week. This includes 120 officers killed in the performance of duty in 2012 and 201 officers killed in prior years. These names will be formally dedicated at the 25th Annual Candlelight Vigil on Monday May 13, 2013 at 8:00 pm. 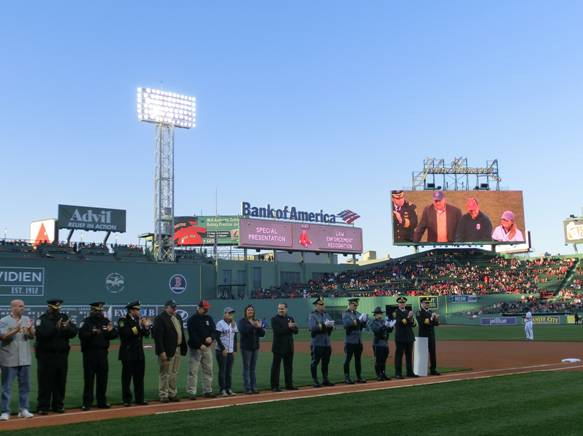 Last Friday, April 19, our Law Enforcement Appreciation Night with the Boston Red Sox had to be postponed, for good reason. The entire city—especially our law enforcement professionals—was focused on responding to the Boston Marathon bombing and apprehending the suspects involved. Sadly, there were many victims, including MIT Police Officer Sean Collier, who was killed in the line of duty. Our thoughts are with all the victims, their families, and our first responders and law enforcement officers, who ran towards danger to help those in need. 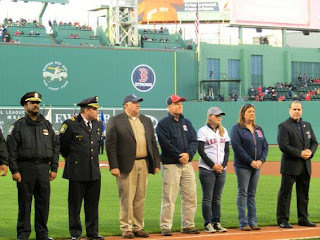 Thanks to the great support from the city of Boston, the Boston Police Department, volunteer Ambassador Chris Shoppmeyer, and the Boston Red Sox, our Law Enforcement Appreciation event was quickly rescheduled for Sunday, April 21. All involved in coordinating the event felt it was important for us to honor law enforcement as planned, especially after the heroic response following the bombing. 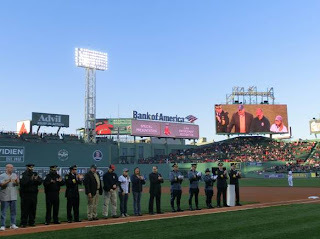 Before the game started on Sunday, National Law Enforcement Officers Memorial Fund staff, along with friends, family, and agencies throughout the Boston area, took the field for a moment of tribute. The Boston Police Department’s Honor Guard presented the colors. 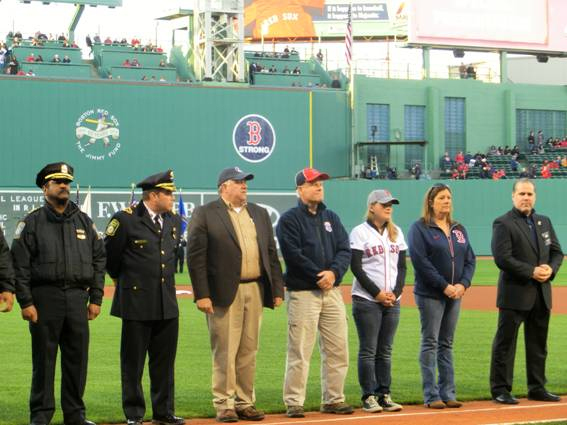 Overall, it was another great event that not only recognized the 2012 fallen officers from New England, but highlighted the important work law enforcement does every day to keep us all safe. More than 600 tickets were sold, raising more than $3,000 for the Memorial Fund. In addition to that generous contribution, a check for $23,200 was presented by the Massachusetts Major City Police Chiefs Association to the Memorial Fund. Thank you to all those who participated. We are truly grateful for the incredible show of support for our law enforcement community in Boston! The Memorial Fund has continued our Law Enforcement Appreciation Events with a number of great ones held this year. We were recently thrilled to have more than 200 people turn out to honor law enforcement on Thursday March 28 in South Florida. The Florida Panthers defended the Buffalo Sabres by one point in the second overtime. Certainly it was a great win for the Panthers, but also a great opportunity to honor law enforcement officers, including the recipients of the Memorial Fund’s February Officer of the Month Award, Boynton Beach (FL) Police Officers Christopher Munro and Eric Reynolds. 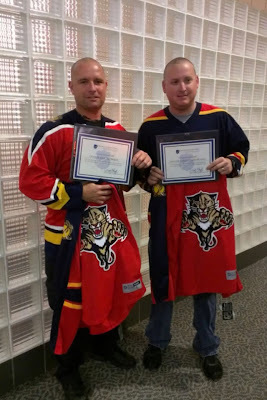 The Panthers joined us in recognizing Officers Christopher Munro and Eric Reynolds, who took the ceremonial slap shot at the start of the game. During the second half, Andrew Raphael presented the officers with their Officer of the Month Awards, on behalf of the Memorial Fund. In June 2012, Officers Munro and Reynolds were involved in apprehending a suspect that had fled from an armed robbery. They used their keen skills to identify the suspect despite faulty alert information. Officer Reynolds was shot during the apprehension but has recovered. In addition to being recognized by the Memorial Fund, both officers received the Boynton Beach Police Department’s Combat Cross Medal. Overall, the night was a great success. Law Enforcement Appreciation Events bring us together to honor our public safety professionals and raise awareness and support for the National Law Enforcement Officers Memorial Fund. A special thank you to the Florida Panthers and Mr. Raphael for a wonderful event. Gary Jones, Sean Smoot, Shanda Berry, Joshua Bowman, and Stuart Levine are just a few individuals who not only help to support the Memorial Fund as Ambassadors and Guardians, but also as riders with the Police Unity Tour. Each volunteer rides not only to help raise awareness and funds for the Memorial, but often for a personal reason that is close to their hearts. Participating in the Unity Tour brings the Memorial alive for riders, as well as the many people who witness them ride through their communities. Joshua Bowman said he rides because of the connections he has, being on the job every day and knowing the sacrifices of those who just were performing similar duties when their watch ended. Rider Stuart Levine says he participates because after riding 300+ miles, the pain you endure is just a fraction of the pain that the families of the fallen officers feel on a daily basis. It all started back in May of 1997 with Patrick P. Montuore of the Florham Park (NJ) Police Department. Officer Montuore (now Chief) wanted to honor officers who had died in the line of duty and draw attention to the sacrifices they made. The idea was to raise money by riding a bicycle from Florham Park, NJ to the National Law Enforcement Officers Memorial in Washington, DC. In that first year, 18 riders came together to raise $18,000 in just four days. 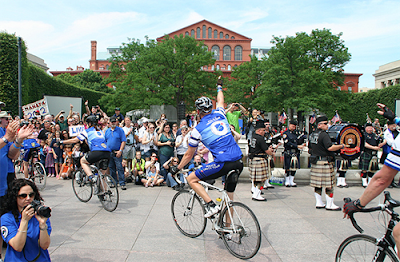 Last year, more than 1600 riders participated from all over the country, donating over $1.65 million to the Memorial. Over the last 15 years, the Police Unity Tour has done much more than one could have ever imagined to honor the lives and sacrifices of fallen heroes and support the Memorial Fund. The money raised and donated to the Memorial has supported a number of important projects. The Unity Tour raised $5 million for the National Law Enforcement Museum to sponsor its Hall of Remembrance, where all those who have died in the line of duty will be remembered. Also, the group funded a $1.1 million restoration project of the Memorial walls that included the re-engraving, coating and sealing of each name. All these accomplishments wouldn’t be possible without the individual support of many passionate volunteers.